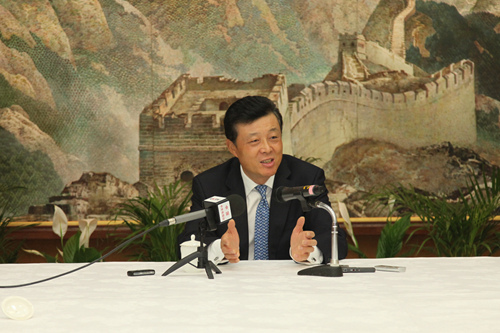 As Prime Minster David Cameron's visit to China approached, Ambassador Liu Xiaoming gave a collective interview to Chinese media in the UK, including People's Daily, Xinhua News Agency, CCTV, China News Service, China Daily and Economic Daily on the Prime Minister's visit and China-UK relations. People's Daily: At present, China and the UK have witnessed rapid growth in economic and trade cooperation. What are China's expectations for Prime Minster Cameron's visit to China? Ambassador Liu: At the invitation of Chinese Premier Li Keqiang, British Prime Minister David Cameron will pay an official visit to China from December 2 to 4 and hold a new round of annual meeting between the two heads of government. Prime Minister Cameron will bring the largest-ever British delegation with him, which includes ministerial officials in foreign affairs, health, culture, environment, technology and trade and nearly 150 business leaders. During the visit, Premier Li Keqiang will hold talks with Prime Minister Cameron and other Chinese leaders will be meeting with him. Besides Beijing, Prime Minister Cameron will also visit eastern and western Chinese cities to gain a comprehensive and in-depth understanding of China. It will be British Prime Minister's first visit to China since the new Chinese leadership took office and the highest-level bilateral contact between China and the UK over the past two years. It is highly significant to the development of China-UK relations. China attaches great importance to it and is ready to work with the UK to strengthen political mutual trust, promote practical cooperation and enhance mutual understanding to inject new vigor into the healthy and steady growth of China-UK relations. Xinhua News Agency: How do you see the current China-UK relations? Firstly, complete dialogue mechanisms. 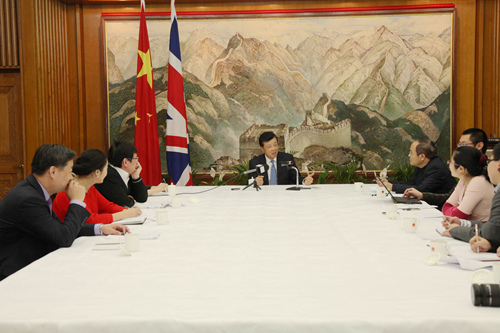 China and the UK have established complete high-level mechanisms for dialogue, including the annual meeting between Chinese Premier and British Prime Minister, Economic and Financial Dialogue, Strategic Dialogue, high-level people-to-people exchange mechanism and regular exchanges in trade, technology and education. During the recent the Fifth China-UK Economic and Financial Dialogue, the two sides reached a record number of 59 outcomes with many breakthroughs. The upcoming visit by Prime Minister Cameron will restart the mechanism of annual meeting between the two heads of government. The two countries have also maintained sound interactions within the UN and G20 frameworks and stayed in close communication and cooperation on such global issues as global governance, the Millennium Development Goals and climate change. Secondly, brilliant cooperation results. China is Britain's second largest trading partner outside the EU, second only to the United States. From January to October this year, volume of China-UK trade in goods reached US$56.1 billion dollars, increased 7.5% from the previous year, excelling in trade relations between China and other EU countries. Two-way investment has kept expanding towards a more balanced pattern. In the past one and a half years, Chinese investment in the UK has exceeded the past three decades combined. Last year alone, Chinese companies invested in projects worth over US$ 8 billion dollars, accounting for nearly one eighth of China's FDI this year. Britain has become the fourth largest investment destination of China. China-UK financial cooperation is developing rapidly. Offshore RMB business in London is thriving, accounting for 62% RMB trading outside China. In June, China and Britain signed a currency swap line of RMB 200 billion yuan, the first currency swap agreement ever signed between China and a major developed country. Thirdly, dynamic people-to-people exchanges. Britain is the largest recipient of Chinese students among European countries. There are currently over 130,000 Chinese students studying in the UK, and nearly 5,000 British students in China. British history, literature, TV series, soccer, music and fashion are very popular in China, while it has become a trend in the UK to learn Mandarin and study China. Britain leads Europe in the number of Confucius institutes and Confucius classrooms. Launched not long ago, "Generation UK" is an ambitious project designed to send over 15,000 young Britons to China in the coming three years to study in Chinese universities there or work as interns. Starting next year, Chinese will become the only Asian language among the six selective foreign language courses for third-grade primary students and above in Britain. A Pew research shows that British citizens have shown more good feelings towards China than many other major western countries. In addition, China-UK exchanges in tourism and at sub-national level have also witnessed a strong growth momentum. Economic Daily: What do you think are the main problems in China-UK relations? How to properly handle these problems? Ambassador Liu: China and the UK have no geopolitical conflicts or outstanding historical issues, and there are no fundamental conflicts of interests between the two countries. China and the UK differ in history, culture, development stage and social system, it is natural that we have different views on some issues. The key is to take a correct attitude toward and properly handle these differences. At present, the main problem in China-UK relations is still the lack of political mutual trust. Some people in the British society have yet to abandon the Cold War mentality and still see China through colored lenses. To solve this issue, we should continue to enhance mutual trust and understanding. First of all, we should enhance mutual trust through dialogues. We should deepen dialogues at various levels and in various fields in the spirit of mutual respect, equality, mutual benefit and win-win outcomes. We should also consolidate consensus, expand cooperation and resolve differences in order to inject more positive power to bilateral relations, jointly promote healthy and steady development of bilateral relations and contribute to world peace, stability and prosperity. 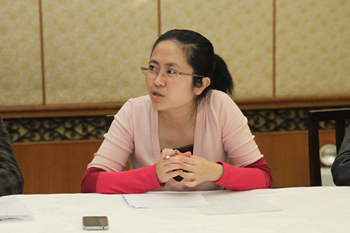 Secondly, we should enhance mutual understanding through exchanges. Both China and the UK have a remarkable history and splendid civilization, both are committed to reform and opening-up, and both have a pioneering and innovative spirit. The two countries should increase cultural and people-to-people exchanges in education, culture, technology and tourism to break the stereotypes in people's mind and encourage our people to look at a modern China and a contemporary Britain from a new perspective. In this way, we can foster more good feelings and friendship between the two peoples and lay a solid foundation of public support for bilateral relations. China Daily: What should be done to promote further development of China-UK relations? First, opportunities from reform. Both China and the UK face the daunting task of comprehensively deepening reform. The recent Third Plenum of the 18th CPC Central Committee drew up a master plan for comprehensively deepening China's reform, sounding the clarion call for a new wave of reform in China. Britain is making vigorous efforts to promote reforms in finance, education, medical care and social welfare. Reforms in the two countries will powerfully drive development in the two countries and bring new and greater opportunities for China-UK cooperation. The two sides should seize the opportunities and draw up a blueprint for future China-UK cooperation. Second, opportunities from opening-up. China has dedicated itself to opening-up and China's interests are now interwoven with the rest of the world. The policy of opening up has not just enabled rapid growth in China but also made China a major engine for world economic development. The establishment of China (Shanghai) Pilot Free Trade Zone is the latest outcome of China's opening-up policy. The UK has upheld the principle of openness too. It supports free trade and globalization, opposes protectionism and welcomes Chinese investment. China and the UK should work together on the basis of the common principle of openness to capitalize on our complementarities, achieve win-win results and promote free trade in the world. Third, opportunities from new understanding. China and the UK both have a time-honored history and brilliant culture. Today, Chinese and British people are trying to discard old mindset and rediscover the other side. In the eyes of the Chinese people, Britain is no longer conservative or reserved but full of innovation and creativity. And in the eyes of the British people, China is no longer mysterious or incomprehensible; they now see China as a dynamic country with unique appeal. The two sides should make the most of these changes in perceptions and transform public enthusiasm and new understanding into real advantages and new impetus to promote the bilateral relations and lay a solid social foundation for sound and steady growth of China-UK relations. CCTV: Prime Minister David Cameron is bringing a large number of business leaders from various sectors on his visit. What's your comment on the China-UK trade and investment cooperation and its prospects? Ambassador Liu: In recent years, China and the UK have made smooth progress in trade and economic cooperation. The UK is leading among China's main EU trading partners in terms of trade and mutual investment with China. A set of facts and figures I mentioned when answering the second question are all good examples. It should be said that China-UK economic and trade cooperation has become the main content and driving force for bilateral relations. Meanwhile, we see great potential in further cooperation. In bilateral trade, China and the UK are the second and fifth largest economy in the world, while China-UK trade only accounts for 1.4% and 6% in our total trade volumes with other countries. This is not commensurate with the standing of the two countries as major economies. As the living standards in China rise, the demand for British quality consumer products and modern services will grow. The UK is the second biggest innovator in the world, but its high-tech exports to China only ranks the fifth in EU, after Germany, France, etc. As China restructures its economy and promote industrial upgrading, it will offer more potential for high-tech trade between the two countries. In investment cooperation, despite rapid growth of Chinese investment in the UK, China still lags behind quite a number of emerging economies such as India, South Africa and Russia in making investment in the UK. Chinese investment in the UK enjoys a broad space for further growth. Chinese companies value the UK's status as a financial, information and logistic centre. They will increase investment in such areas as recourses, R&D, brand names and the Internet. In addition, infrastructure construction is thriving in China and the UK. The two countries can work more closely together in nuclear energy, transportation, communications, water treatment and clean energy. In services and financial cooperation, British companies are paying increasing attention to the Chinese market. As China opens wider to the outside world, the modern service industry in the UK will witness a relatively fast growth in their presence in China. China and the UK will move faster in such areas as modern financial cooperation, the internationalization of RMB and the development of financial centre. Prime Minister Cameron is traveling with a large business delegation to China. It fully embodies the confidence and enthusiasm of British companies to engage in cooperation with China. I believe with support from the two governments, the two business communities will explore new areas and forms of cooperation to push bilateral economic cooperation forward and score new achievements on the existing basis. China News Service: Next year, Chinese will become the only Asian language among the six selective foreign languages for primary students in third-grade and above in the UK. To learn Chinese and study China have become increasingly popular in the British society. How should the two countries take the opportunity of Prime Minister Cameron's visit to deepen the cooperation in culture, education and technology? Why is it important? Ambassador Liu: There is a solid basis for cooperation between China and the UK in areas of culture, education and technology. In April 2012, the two countries signed the Memorandum of Understanding Between the Governments of China and the UK on the Establishment of the High-Level People-to-People Exchange Mechanism to deepen cooperation in education, technology, culture, media, sports and youth. The MOU established a platform at a higher level for bilateral people-to-people exchanges. In the educational field, the two sides established an annual consultation mechanism between ministers of education. China-UK cooperation in education has scored remarkable achievements. Such cooperation is government-led and widely participated by the public. It is wide-ranging and rich in content. 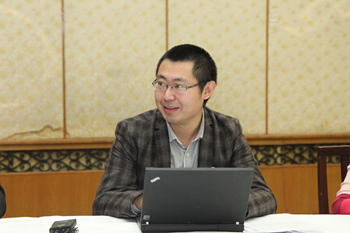 Bilateral exchanges and cooperation in education covers higher education, basic education, vocational education, language and culture; major players include educational authorities at all levels and educational and scientific research institutions of various kinds; forms of cooperation include personnel exchanges, project cooperation and construction of mechanism platforms. In the scientific and technological field, the two countries signed the Technological Cooperation Agreement Between Chinese and British governments (hereinafter "Agreement") in 1978. 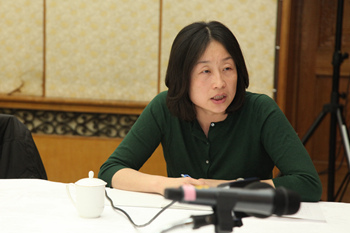 Under the framework, related scientific research departments and institutions between the two sides signed over 20 agreements or MOUs in basic research, health, agriculture, water conservancy, forestry, aviation and space and established the China-UK Joint Committee on Science and Technology and China-UK high-level dialogue mechanisms on sustainable development and health. After more than 30 years of steady development, scientific cooperation between China and the UK has become a key link in the bilateral relations. In 2011, Britain overtook Japan to become China's second largest partner in research papers publication. In the cultural field, since the launch of China-UK high-level people-to-people exchange mechanism, bilateral cultural cooperation has experienced fast growth. A series of cultural event organized by the two sides have made innovation, grown in standards, scale and mechanism, and reached new heights in terms of depth and width. According to preliminary statistics, from January 2012 to November 2013, there were over 500 people-to-people exchange events participated by over 8,000 person times, and nearly 300 delegations mutual visits between the two sides. Culture has grown into a strategic underpinning force for relations between the two countries and a major factor for enhancing understanding, friendship and cooperation. In the next stage, China and the UK should seize opportunities and work together to open up brand-new prospects in people-to-people exchange and in education, culture and technology. First, develop top-down design. China-UK high-level people-to-people exchange mechanism is an important channel for the two sides to advance people-to-people exchanges and cooperation in various areas. 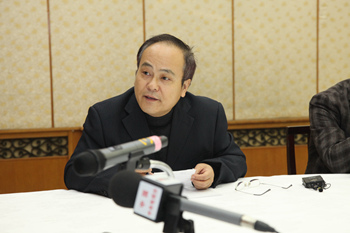 The two sides should make overall plans and set development goals to plan for future cooperation. 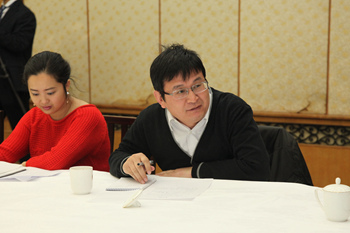 Second, strengthen policy dialogues. Under the framework of high-level people-to-people exchange mechanism and relevant bilateral agreements, the two sides should strengthen policy dialogue at all levels, maintain frequent communication and consultations, make cooperation plans, implement cooperation projects and resolve problems in cooperation in a timely manner to remove obstructions and give new impetus to cooperation in culture, education and technology. Third, expand non-governmental exchanges. 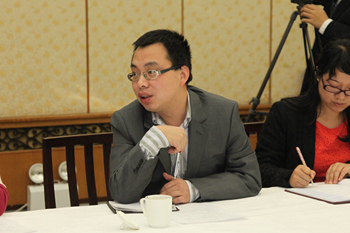 There are many non-governmental institutions in areas of education, culture and technology in China and the UK. They are a good supplement to inter-governmental cooperation. The two sides should further encourage these institutions to work together and achieve parallel progress on the governmental and non-governmental fronts to advance cooperation and build friendship between the peoples.